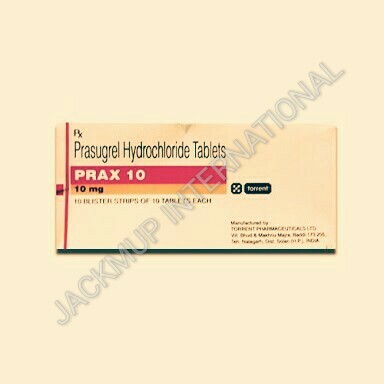 Description:- Prax 10 mg tablet is used in the treatment ofheart attack. It prevents platelets from sticking together, which decreases the formation of harmful blood clots. Consult your doctor if you have any of the following medical conditions: high blood pressure, blood disease, bleeding problems, or bruising, heart problems, abnormal blood clots in your arteries or veins causing stroke, chest pain or pain/swelling in legs, hypothyroidism (under-functioning) of thyroid gland, pancreatic or gallbladder disorders, liver problems or jaundice, skin and subcutaneous tissue disorders including infectious/non-infectious skin rashes, diabetes or seizure disorder. Tell your doctor if you have or are going to undergo a surgery, including dental surgery. Sunitinib can cause dizziness and unusual tiredness. Do not drive or operate machinery or engage in activities requiring mental alertness and coordination, until you feel fine. Sunitinib may cause your skin to turn yellow and your hair to lighten and lose color. This is normal and not a cause for concern. Your blood pressure should be checked regularly while you are taking sunitinib as it may cause high blood pressure.